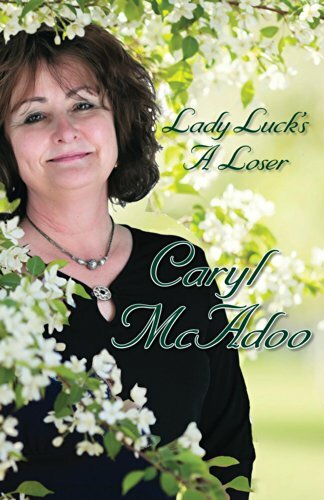 My first fiction title bought by a traditional publishing house that actually paid an advance, THE APPLE ORCHARD BED & BREAKFAST, debuted in 2002, then I re-named it LADY LUCK’S A LOSER and re-released it as my first Indie in April 2014. 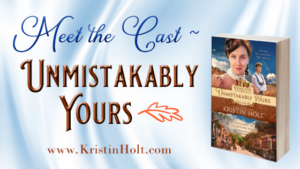 But one thing my editor loved and many reviewers remarked on was the story’s cast. Hero W.G. Preston is a bit of a hermit widower ready for another woman in his life, but he has no desire to go through the dating scene. A wild idea develops to bring women to his home as manager candidates for his East Texas bed and breakfast. After interviews, he invites eight to stay, putting them through games and contests to eliminate one each month. Anyway, the complimentary reviewers remarked how all eight women were easily followed and recognized as individual characters. Each had their own voice and separate personalities. So that was twenty-seven books ago. 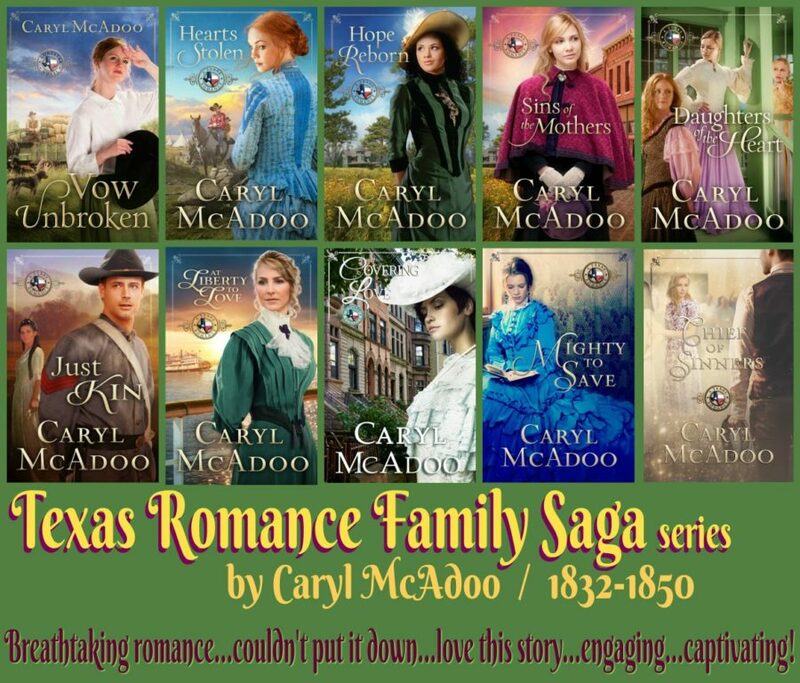 My last family saga, the Texas Romance series covered five generations and over 100 years, so I kept detailed ‘Character Profiles’ as I wrote each successive book to keep birthdays and young children straight as they grew up to become the heroes and heroines! Fast Forward to GONE TO TEXAS, in 2018. I didn’t mean to do it to myself, but the story is what it is . . . three families united by blood and friendship, swindled, faced with a horrible choice. 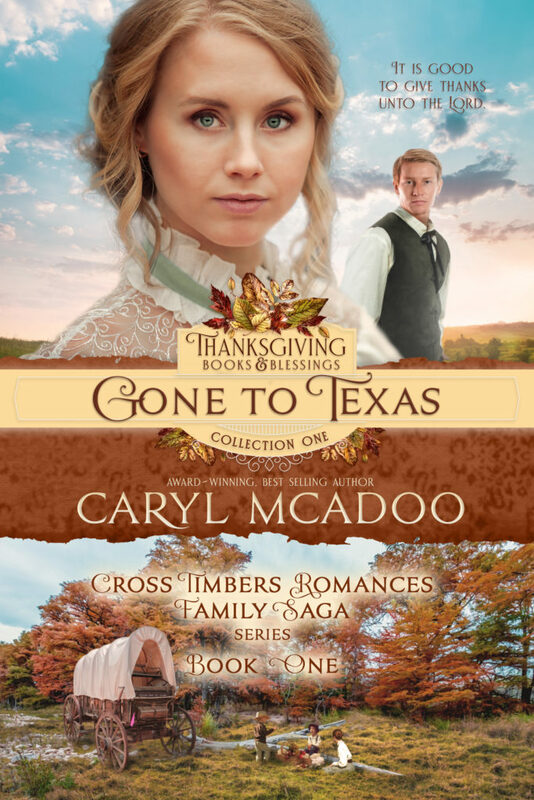 Three adults including Liberty O’Neal, her younger brother Laud Worley, and her best friend Mallory Van Zandt and their spouses (six folks) and children (seven and counting) equals thirteen—plus a widower, his daughter and his slave equals sixteen folks . . . then Josie Jo Worley is born just before the clan leaves Tennessee. Seventeen souls! My challenge is to keep them all separate for my readers, until you get to know them as individuals. Consider being put into a room and in the time, it takes you to read the first few chapters of my book, getting to know all those people . . . not an easy task. But I do love a good challenge! I started by introducing two of the main characters in the book—hero Flynn, nineteen-year-old son of Reagan and Liberty and his heroine Alicia, seventeen, oldest daughter of Seve and Mallory. I toss in some of the children and Laud’s wife Esther as side characters, pretty much staying in his or her POV (point of view) several chapters so the couple are firmly in readers’ good graces. Some reviewers comment that I change POV a lot, and I do. That’s what helps my readers get to know my characters in a deep relationship. But I always let them know with the use of a page break when I’m moving from one character’s perspective to the next—how I choose which character is all about who has the most emotion at risk in that scene. At the very beginning after a page break, I always mention the new POV Character by their proper name, so readers always stay abreast of who is telling the story now—and until the next break. This way readers can know what different characters are thinking that other characters may not know, giving them a superior position! Seventeen folks to introduce in one story is definitely a challenge, but I know that I can do all things through Christ Who strengthens me. He’s never forsaken me or left me high and dry. I can’t begin to imagine what my stories would be like without Him, and praise God that I’ll never have to. So y’all pick up your copy! Pre-order today for delivery tomorrow. That REALLY helps authors as all those pre-orders are marked as sold Debut Day which catapults the title up in the rankings. Thank you, bless you. I hope to see you tomorrow at the Launch Day Celebration party! 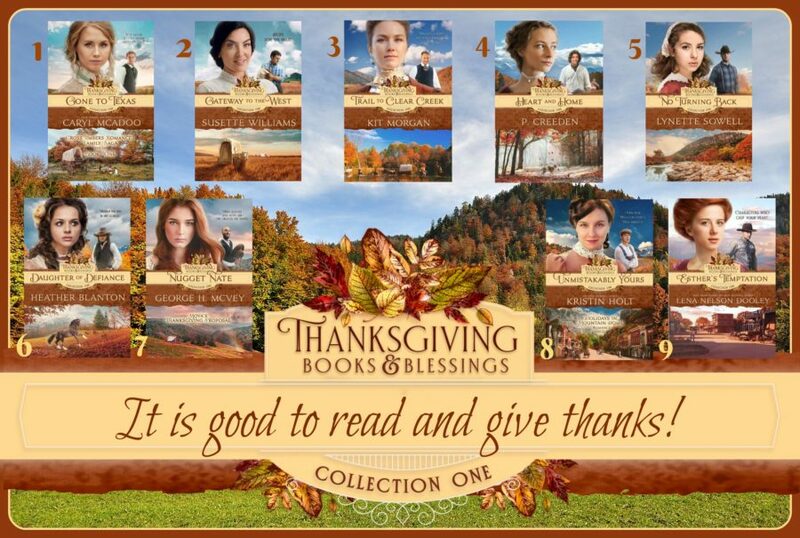 Nine authors with one hour each to visit and tell you about their novel/novella in the Thanksgiving Books & Blessings Collection! And giveaways—WooWee! Then click over to the party and click “Going”! 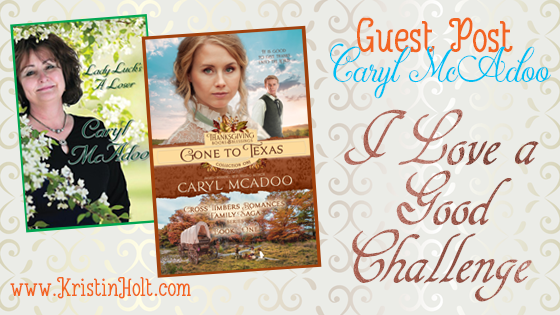 Did I mention LOTS of giveaways??? 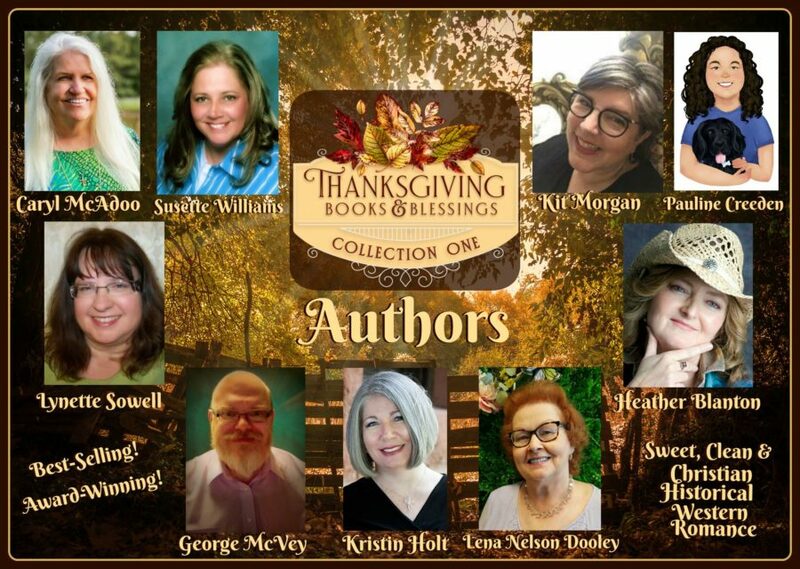 It starts at 10 a.m. and lasts until 7 p.m., but winners are not announced until Friday morning by 10 a.m. so that everyone has time to get in there and enter all the giveaways and visit with the authors. Click HERE for the party. You’re most welcome! My pleasure.